One of my first obsessions when I moved to the Mile End was the Japanese paper store, Au papier japonais, at 24 Fairmount West. I have spent hours in that store looking at all the different prints, textures and colours of paper the store carries. The price may initially seem steep. However, when you consider that Washi paper is made from longer fibers than what we use in North America and that it is harvested by hand, the price is justified. I started out just buying the small packages of remnants and making paper mosaics on dollar store boxes for fun. Then I got more ambitious and wanted to take a class. Yes, Au papier japonais has a series of workshops to give you an idea of all the beautiful things you can do with Japanese paper. As a Christmas present this year, my husband paid for the Traditional Japanese Cardmaking Class for me, and it couldn't have come at a better time, as January is high season for winter funk. The class was held at the the store's art studio on St. Laurent Boulevard. When I walked in on this cold January morning, I felt the dry warmth of a woodstove. As I looked around, I noticed a sculpture garden in the back, some beautiful paintings on the walls and a collection of fabric stamps. This was also the owners' art studio. Making Japanese cards required more skill than I had anticipated. I needed to learn several things, such as using an Xacto knife so that I didn't rip the paper (pssst it's all in how you hold the knife), cutting in a straight line (it looks so much easier than it is), finding centre points to make folds, piercing the paper with an awl and using an absolute minimum of glue. There is actually a method for using a glue stick so that it lasts longer than a few days. Our instructor, Heather Midori, is an artist who uses washi as her preferred medium. She showed tremendous patience and repeatedly reminded us that we were all learning new skills. The first card was the most difficult because we had to apply all the skills we had just been shown. The second and third cards were much easier and allowed us to use more creativity. I immediately wanted to go home and use these skills again, so I wouldn't forget. 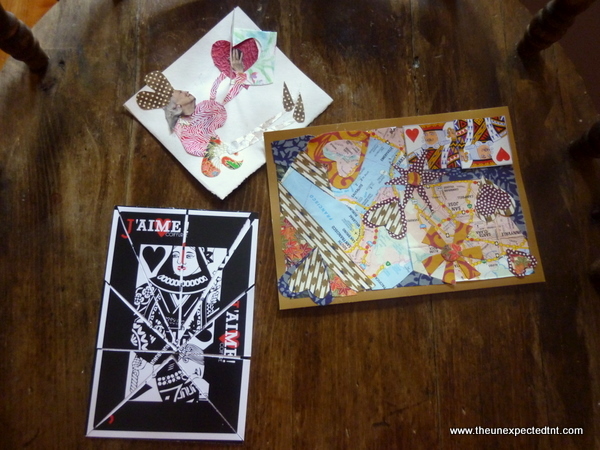 Last weekend, I made some Valentine's Day cards with my son and decided to take some Japanese paper to work and invite some people to join me in making Valentine's cards over the lunch hour. Initially, I encountered a lukewarm response, but when I told them that I had five different colours of glitter glue, four people immediately jumped on board. Because some invitees had previous plans that day, they asked if I could do it the following day, which I did. This time 10 people showed up, including a woman who brought even more cardmaking supplies. Then someone suggested that we do it again on the third day. On day three, more supplies arrived in addition to a very welcome box of Valentine's Day chocolates. On the last day, when I heard someone say, "Oh, I'm just not that creative," I immediately thought of Lynda Barry's talk about creativity in January. Echoing Lynda I said, "That's just your inner critic talking to you. If you can't turn her off, you ought to at least turn her down." Everyone laughed, as our inner critics were all sitting at the table with us. Once you realize that creativity is just trying new things and new combinations to see the result, a lot of the stress disappears and the fun starts. This was an enjoyable activity and a great way to relieve winter funk. 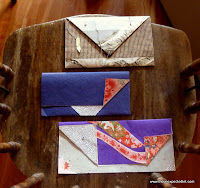 : Remedy: Japanese Paper for Winter FunkTweet this!